I have been so busy checking nests but haven't been able to muster the energy to write about all that I am observing. On the high note, I was able to see the chicks that hatched two weeks ago....so big, so fast. Watching them toddle around on the nest and looking out at their world is such a thrill, even after all these years. 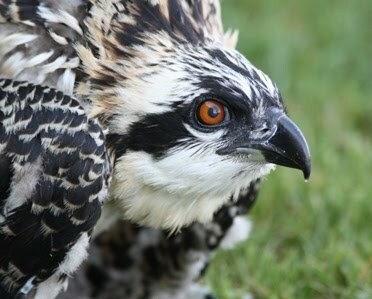 Of course I am a bit biased, but I think there is nothing cuter than a baby osprey! I am observing indications of hatching on many more nests now, but have only seen chicks on one of them so far. On a sadder note, we have had at least five or six nests fail already. Sometimes I have no idea why....one week they are happily incubating, and then the next week there are no Ospreys on or near the nest. Sometimes we find both adults, but they are no longer incubating. On one nest I have been slowly putting the pieces of the puzzle together. This nest had the same female as last year but the male from past years did not return. She hooked up with another male, who I have known for quite a few years. He was somehow displaced from his original nest by another male. The early part of their relationship seemed to be going well, they were copulating, working on the nest, and eventually eggs were laid. In late April I did see this male bringing fish and sharing incubation duties. But in early May he seemed scarce. Another male was seen here occasionally, sometimes two males chasing each other. This past week I spent some time observing and found the female leaving the nest, presumably to feed herself. The second male was perched nearby, even bringing sticks to the nest, but he would not bring her any fish or incubate. She did not chase him away. One day the female was gone and the male was messing around in the nest, sitting down and digging with his legs, a behavior that is often done to prepare the nest cup for eggs, but can also be done to destroy eggs. When the female returned she was all wet, but her crop was empty. Sigh. She landed on the nest perch, and took a long time before she went into the nest and walked around. I knew it was over. So sad. I have no idea what happened to the first male. The second male seems to be claiming the territory, and the last time I was there he was alone, working on the nest. This is the way of things in the world of Ospreys. This morning we see that one of the eggs at the Arboretum cam nest is damaged and laying off to the side. They are still incubating the remaining egg. What is going on? These eggs seem to break so easily. I wish I could provide an answer but I can't. We are seeing other nests failing now too....some where no eggs have been laid, some where apparently something happened to the eggs. But this is why we keep watching and documenting the best we can. PS. Becki you can contact me privately at osprey.mn@gmail.com to give me more info. encourage the wee ones to eat. These early feedings are over so quickly. Those tiny crops just can't hold much! Th male has taken what is left of the fish and moved to the nest perch to eat. So we are off into the next phase of the breeding season. Our work gets harder now....I waited for two hours for this confirmation of hatching, tho I knew from the adults behavior shortly after I arrived. I waited for proof. New nests continue to pop up...another one reported by one of our long time volunteers yesterday...and sadly our first report of a failed nest. Both adults are fine, but they are no longer incubating, so something happened to the eggs. We can break out the bubbly tonight because we have our first chicks of the 2016 season! Our population of Ospreys is booming this year. We have found nine new nests so far this year. First let me define what we mean by a "new" nest. It may seem obvious but the way scientists count and calculate data can be diverse and In some cases downright misleading. When we are counting nests, we are not actually counting a pile of sticks....we are counting breeding territories, which also means we are counting breeding pairs, and are documenting the expansion of this reintroduced population. In other words, if a nest blows down in a storm and is rebuilt in the same place by the same pair of Ospreys, it is NOT counted as a new nest. It's just new sticks in a pre existing territory. Also if a pre existing nesting territory has one new bird, it is not a new nest. Even if it's a totally new pair, it is still not a new nest. If an existing nest is used for years, then is not occupied for one or more years and then is reoccupied, it is not a new nest. It is still counted as the same nesting territory. When a pair of Ospreys nests unsuccessfully, eggs do not hatch or chicks die, and they then build what is called a "frustration nest"....a new nest near an existing nest, built by the same pair of Ospreys, it is NOT counted as a new nest, since this would be counting the same pair of Ospreys twice, which can lead to artificially inflated numbers. This is why identifying the Ospreys is important. Some of this does become more difficult as we have fewer and fewer banded Ospreys, but we can still often identify a frustration nest by the timing of the nest building and the proximity to another failed nest. When a new pair builds a new nest in a totally new place , where no nest has ever been occupied previously, THAT is considered a new nesting territory. So our criteria of what we call a new nest is very carefully thought out so we can actually document the expansion of our population of Ospreys without misleading or inflating the numbers. We are always very careful about the terms and methods used and if we don't know something or are not sure about something, we will state that. We try not to jump to conclusions without factual evidence to support our comments. So to find this many new nests this early in the breeding season is important. Most of these nests have been found by me or my volunteers, but a few have been reported to us by some one in the public or some property managers. We are very grateful for those reports. I am sure there are some we don't know about and we continue to make pleas for the public to keep their eyes open and to let us know as they discover new nests being built on cell towers, Ballfield lights, transmission towers and other man made structures. Thanks to all who contribute to the success and accuracy of our research! The Arboretum cam nest Ospreys have laid their first egg! Finally! Both adults are sharing incubation duties. They commonly lay 2-3 eggs, tho we have seen four. It remains to be seen if this pair will lay more eggs since they are getting a late start. Eggs are usually laid about 2-3 days apart tho there is some variety in that timing from pair to pair. This is not the latest egg laying we have seen, so if all goes well they will have time to raise the chicks and get them fledged and ready for migration by late September. Sorry its it's been a while since my last post....I was on another planet last week, seeing Sir Paul twice. Beatlemania had a strangle hold on me. What an experience! But I have been checking nests and am still plugging away at band reading. We have discovered seven new nests already, so the population is booming. Hoping people will keep us posted about new nests! Thanks to all the people who have contacted me after seeing the Kare 11 coverage. I will answer each email and message but it's a crazy week with Sir Paul in town, and so much going on in the pottery world and my work. A reminder that an important bit of info that was cut out of the TV spot was that we need people's help in finding new nests.....so if you see Ospreys carrying sticks, or fish, do watch where they are going and send me an email. They are increasingly nesting on cell towers, ballfield lights, transmission towers and other man made structures. If you know of any new nests in the past few years, we want to know about them! We are also interested in working with Boy Scouts who want to earn their Eagle Scout badge by putting up an osprey nesting platform. Our population is booming and we want to help them find good safe homes!